The rockers - Ronnie, 65, Sir Mick Jagger, 69, Keith Richards, 69, and drummer Charlie Watts, 71, - performed a series of live concerts last year to mark their 50th anniversary, and Ronnie is keen to continue the celebrations. He admitted he is keen to play at the music festival, and is determined to get the other Stones on board. Asked about Glastonbury he said: "Wouldn't it be nice? We've got a meeting next month and that's going to be my first question to them. "It's something I've always been interested in. I'm going to twist their arms." And he is also hopeful they will extend their tour, after playing a few dates in London, New Jersey and Paris last year. Ronnie said: "I've got lots of high hopes this year, now that were all rehearsed - let's get it cracking this summer!" 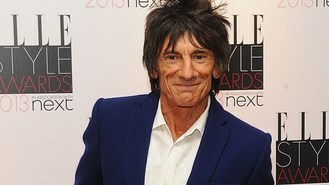 The 65-year-old rocker was partying at the Elle Style Awards at London's Savoy Hotel, where guests including Bradley Cooper and Kate Hudson enjoyed a night of high fashion and Cointreau cocktails. He had just returned from his honeymoon after getting married for the third time, to 34-year-old theatre producer Sally Humphreys. He joked: "I've just come back from my perma-moon haven't I? "We got to be nice and peaceful on Mustique, we had a house, empty, beautiful beach, fantastic."